The foundations then were laid for remote-controlled vehicles and weapons just as the First World War began. World War I proved to be an odd, tragic mix of outmoded generalship combined with deadly new technologies. From the machine gun and radio to the airplane and tank, transformational weapons were introduced in the war, but the generals could not figure out just how to use them. Instead, they clung to nineteenth-century strategies and tactics and the conflict was characterized by brave but senseless charges back and forth across a no-man’s-land of machine guns and trenches. With war becoming less heroic and more deadly, unmanned weapons began to gain some appeal. On land, there was the “electric dog,” a three-wheeled cart (really just a converted tricycle) designed to carry supplies up to the trenches. A precursor to laser control, it followed the lights of a lantern. More deadly was the “land torpedo,” a remotely controlled armored tractor, loaded up with one thousand pounds of explosives, designed to drive up to enemy trenches and explode. 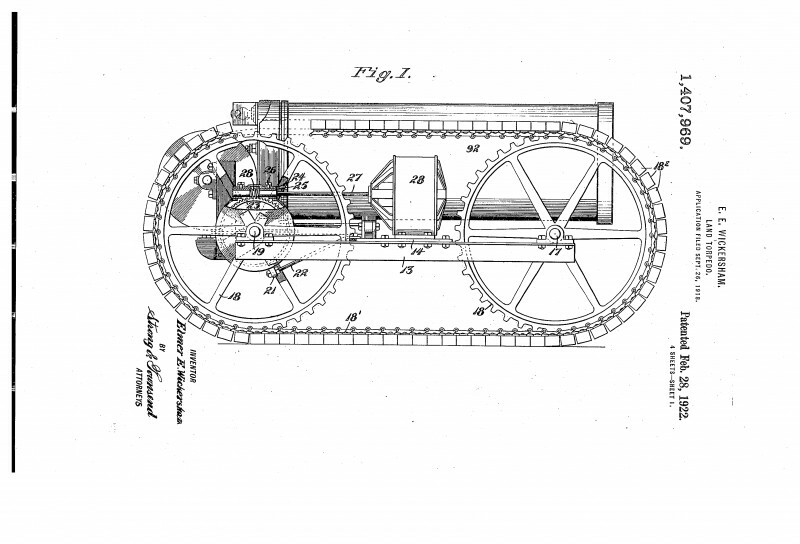 It was patented in 1917 (appearing in Popular Science magazine) and a prototype was built by Caterpillar Tractors just before the war ended.